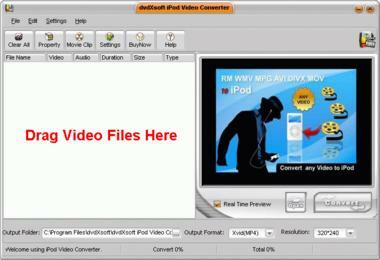 Convert all popular video formats to MP4 files for playing on iPod Video. It can convert from MPEG-1, MPEG-2, MPEG-4, WMV, XVid, DivX, FLV, AVI, RM, RMVB, MOV, and more other formats. iPod Video Converter platinum is a video/movie converting program designed for converting video/movie to Apple iPod video playing by the two formats supported: H.264 and Xvid. 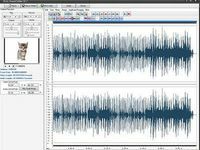 It can convert almost all video format including FLV (Macromedia Flash), DivX, XviD, MOV, RM, RMVB, dvr-ms, MPEG, WMV, AVI to iPod Movie / iPod Video format MP4 files. It supports easy-to-use interface, fatstest converting speed with excellent output Video and Audio quality 1. Support Input/Output preview You can watch the movie when converting movies. Note: There is no sound when you are converting movies. 2. Two-pass encoding mode supported Our iPod Video Converter platinum is the first product available that supports two-pass encoding mode, with this feature it will improves the video quality and doesn't make the file any larger. (note:This takes twice time as long to encode) . 3. 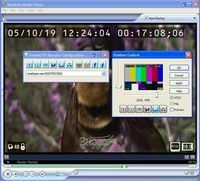 Full WMV, RMVB Supported we use directshow to support the newest WMV9 and RMVB format 4. Clip function supported Our iPod Video Converter platinum can select a clip of movie manually. 5. Optimize iPod Video iPod Video Converter platinum can optimize output Video for iPod, so use iPod Video Converter platinum you will get more fixed video for iPod watching. 6. Power Audio / Video / Subtitle Synchronize With our patent Synchronize technology, you will not have any unsynchronize problem on output iPod Video. 7. 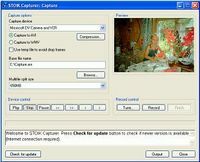 Capture Image You can capture image when you are converting movies. 8. Drag and Drop iPod Video Converter platinum supports drag and drop functions to add movies. 9. Expert Options for Settings Rich options offered. It offers an amazing balance of features for beginners and professionals. Note: we suggest you use default settings, we have optimzed it for iPod Video.